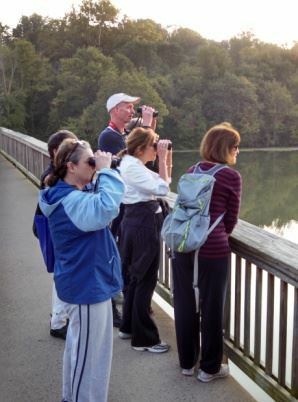 On Saturday, September 20, a group of Villagers went on a bird-watching excursion on Theodore Roosevelt Island, located in the Potomac River adjacent to the Kennedy Center. The island is popular with nature lovers looking for a peaceful respite from the pace of city life. The walk was led by Foggy Bottom resident Dr. TJ Myers. TJ is a veterinarian who works at the U.S. Department of Agriculture and is lifelong bird watcher. Among the species spotted during the walk though the varied habitat on the island included Great Blue Heron, Wood Ducks, Carolina Wren, Red-bellied Woodpecker, Cooper's Hawks, and huge flocks of migrating American Robins.